Like the book of Job, Lamentations pictures a man of God puzzling over the results of evil and suffering in the world. However, while Job dealt with unexplained evil, Jeremiah lamented a tragedy entirely of Jerusalem's making. The people of this once great city experienced the judgment of the holy God, and the results were devastating. But at the heart of this book, at the centre of this lament over the effects of sin in the world, sit a few verses devoted to hope in the Lord (Lamentations 3:22–25). This statement of faith standing strong in the midst of the surrounding darkness shines as a beacon to all those suffering under the consequences of their own sin and disobedience. 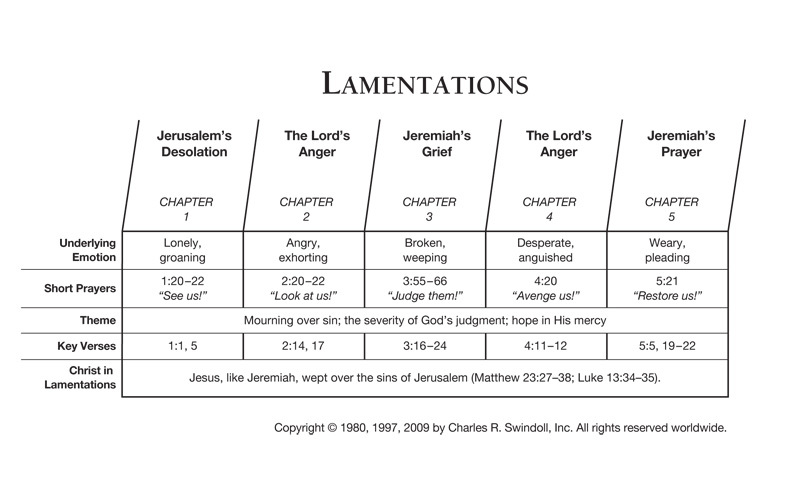 Find resources in the book of Lamentations in our resource library.